Nearly 5 years ago, just 9 months after graduating University, I made what was to be a very bold decision to quit my well-paying job in an effort to chase a hunger for entrepreneurship. This hunger has been chasing me since a very young age. I've found this entrepreneurial hunger doesn't go away. The only way to scratch it is to go deeper into my fears, deeper than I have ever been before. It all began with a small venture of mowing my neighbours' lawns and washing their cars for pocket money. It was well paid but it just didn't scale well as there was a direct correlation between revenue and amount of time I had to put in (aka $5/hr). So there I was 10 years old realising the key ingredient that was missing: leverage. A few years later at the age of 16, I started PulseHosting, a web hosting business in which I had to borrow my Mum's credit card just to prove I was old enough to rent servers. As the business was quite automated it could grow much more effectively and I was able to implement leverage. I loved the idea of this, all I had to do was rent servers and resell them using automated software and take a 30-50% markup. It's amazing how back then I didn't have many fears when starting these ventures. It was like there wasn't a worry in the world, but this was probably more so due to pure ignorance than anything. Fast forward a few years and this entrepreneurial itch still hasn't gone away. Here it was again, 23, fresh out of University as I was confronted with this decision of either quitting my job to build EasyCompanies, or staying inside my comfort zone. The decision was tearing me apart, driving me deep into analysis paralysis. So I consulted outside sources and reached out to family and friends for advice. This only made the situation worse as many would tell me that I should just play it "safe" and that building a business is too "risky". In all honesty, this is the type of approach society teaches us, so I see where they were coming from. Tip: Family and friends will tell you what they need to keep you safe. We all have this inherently in us, and it's a good thing - we probably wouldn't be alive today without this. On top of all the doubt and uncertainty, I had many fears: fears of not being good enough, the fear of being sued, fear of financial loss, fear of the unknown, or the paradoxical fear of failure. Then the more complicated fears like the fear that if I quit my job and start a business I'll never be able to get a job again as no-one will take me seriously. Or the fear that if my business doesn't succeed a future investor will not want to invest in my business. Not to mention the fear that one day the government could knock on our door and shut down the platform. Looking back at it now, it all seems so silly, but these were legitimate fears. It's like the first time you learn to ride a bike, it's scary as hell. But the 10th time it's not so scary anymore and your biggest concerns don't even phase you anymore. So here I was, almost $15,000 in credit card debt, seriously contemplating quitting my job to follow this passion but I was filled with so much FUD (Fear, Uncertainty, Doubt). In spite of all this I got ready to make the plunge. The decision had been made - I'm committed, I'm leaving my 6-figure job to start a business. I can still recall the exact moment, I was standing there in the kitchen and I yelled out "f*** it, let's do this... what have I got to lose?". As I took the plunge, I held on and went to back out of my decision. In that moment my partner at the time was there to push me further (as she assured that everything will be fine, and that she would support me both financially and morally), and this was the push I needed to let go and take the leap. I ran to the study to begin writing my resignation. But of course, like a true entrepreneur I procrastinated on the resignation letter and instead opened a code editor to begin coding the web platform for the newly established business - EasyCompanies. Hello scary World! The primary goal for me was to get EasyCompanies to a point where I could earn enough to match the salary that I would have been earning had I stayed in my existing role. At the same time I wanted to earn the freedom to travel whenever and wherever and work remotely. Reality check: after 9 months the business was performing quite poorly and it was putting a huge financial strain on the household. I wasn't extracting my salary from the business and I was having to put more and more money into it, and my credit card debt was quickly increasing. So there I was again, torn with the decision to give up on the company or keep going. So I set myself a benchmark: if the business doesn't produce a positive cashflow in 2 months I will close shop and walk away. And then it happened, within 3 months I was paying myself my existing salary. Not just that but we were now ready to recruit 2 full time staff members who could now handle customer service while I focused on backend development. Fast forward to today and EasyCompanies has helped over 50,000 businesses start their very own business. In fact, every day 1 in 20 new businesses in Australia are established through our platform. To think of where I would've been if I hadn't have overcome these fears. I've come to learn fear plays a very important role, it tells us when we are embracing an area of growth. We grow when we face our fears and do the things we are most afraid of. Whether you think you can, or you think you can't - either way you are right. When we step outside of our comfort zone and challenge ourselves life becomes such an incredible journey. For me, this has become a good litmus test for making decisions, as more often than not I'll tend to resist the path I'm most afraid of. In saying that there's a caveat. It's important to be kind to ourselves. Whilst we can strive to improve and be "better", we should always remember that we are already enough. We don't need to get anywhere further before we can begin our life. We can begin living right now, in this moment. If we do fail at something we shouldn't dwell on it. Instead, we should realise this is all part of the journey. From every "failure" is a learning, and if we don't learn from it we'll be tested again and again until we do. I've come to rewrite my definitions of failure and success and now I tend to just see everything as it is, neither a "failure" or a "success", it just "is". So when you're confronted with a decision, remember: which direction are you most afraid of? What fears are holding you back from living your dreams? What's stopping you? 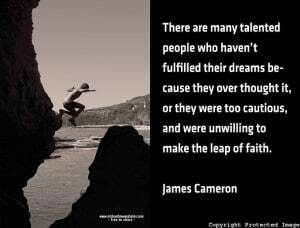 Are you going to "play it safe" or "take a leap of faith"? 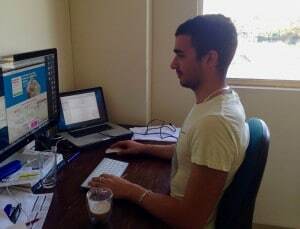 P.S For all the sole founders out there thinking not having a co-founder is holding them back, here's the first photo 5 years ago to this day of me working on the site after I had made my plunge into a leap of faith. Yes, it's just me, myself and I in a lonely little home office. But man was it fun!